THIS MONTH---2 MAMMOTH PETROGLYPHS FROM SOUTHEASTERN UTAH. Beginning in the early 1970's I've seen and handled a large number of prehistoric stone artifacts from all over the world through various casting and photographic projects. Some of them have stood out as being especially important, or exhibiting a high degree of the craftsmen's skill or they may have shown some type of special uniqueness. In the "Gallery Of Archaeology" I will illustrate some of the things that keep me interested in this subject---------------The Stone Age lasted for millions of years which represents almost all the time that humans have been using tools. It's literally a technology that has shaped the world! This picture shows multiple drawings of mammoth No. 2 from the Upper Sand Island Rock Art site in southeastern Utah and images of mammoths. 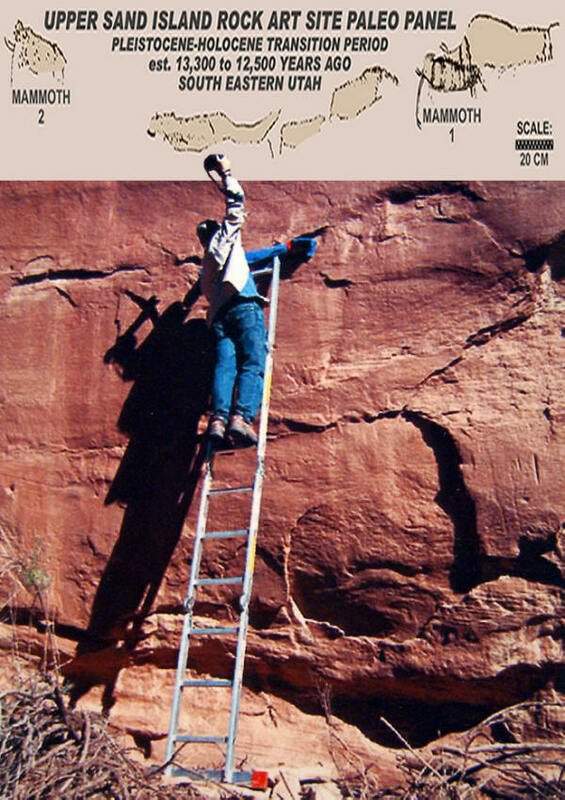 This article illustrates and describes two mammoth petroglyphs located on a site in southeastern Utah. They were discovered within a group of other petroglyphs that are believed to date sometime between the Pleistocene and Holocene periods approximately 13,300 to 12,500 years ago. The information and photographs used in this article were kindly made available by Ekkehart Malotki, professor emeritus of languages at northern Arizona University. "Understandably, the search for graphic portrayals of Pleistocene megafauna, concerned primarily with the identification of probosideans, has led to an assortment of claims that range from the absurd to the potentially plausible and powerfully persuasive." 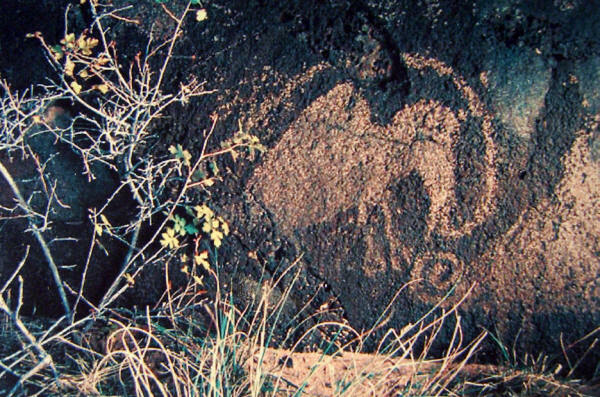 --------2011, Ekkehart Malotki & Henry D. Wallace, "Columbian Mammoth Petroglyphs From The San Juan River Near Bluff, Utah, United States." Rock Art Research 2011, Vol. 28, No. 2, pp. 143-144. "The authentication of two petroglyph depictions of mammoths along Utah's San Juan River clearly confirms the consensus of Late Pleistocene researchers that Paleoamerican humans lived side by side with now-extinct megafauna in the fossil and archaeologically rich region of southeastern Utah." ----2011, Ekkehart Malotki & Henry D. Wallace, "Columbian Mammoth Petroglyphs From The San Juan River Near Bluff, Utah, United States." Rock Art Research 2011, Vol. 28, No. 2, pp. 143-144. "Rock art sites have the special feature of being long-term in situ artifacts. Furthermore, as Schaafsma (1985:241) points out, rock art sites are not "destroyed in the course of being studied," as are subsurface sites that require excavation and hence destruction of the physical record." ---------2000, Carol Diaz-Granados and James R. Duncan, "The Petroglyphs and Pictographs of Missouri," p. 2. 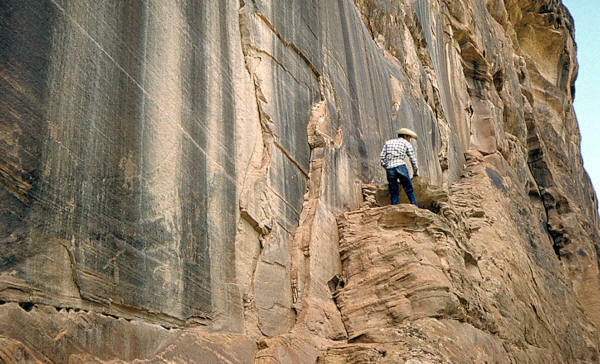 "Vast numbers of petroglyphs appear on slabs, boulders, and broad rock faces throughout America, displaying great diversity in manner of execution and finish. Hammerstones of ordinary form were doubtless employed, but pointed pick-like implements, hafted or unhafted, were better suited to the purpose.."------1919, W. H. Holmes, "Handbook of Aboriginal American Antiquities," Part I Introductory The Lithic Industries, Bureau Of American Ethnology, Bulletin 60, p. 335. "The form of picture-writing known as the petroglyph is of world-wide distribution and is common over most of North America. Petroglyphs may be pecked or incised, or painted; occasionally they are rendered both permanent and conspicuous by being first incised and then painted. They appear on sea-worn boulders, on glacier-polished rocks, on canyon cliffs, and within caves." ----1912, Fredrick Webb Hodge, "Handbook Of North American Indians," Bureau of American Ethnology, Part 2, Bulletin 30, p. 244. "To us (a current native American Indian perspective) these petroglyphs are not the remnants of some long lost civilization that has been dead for many years...they are part of our living culture. What is stored in the petroglyphs is not written in any book or to be found in any library. We need to return to them to remind us of who we are and where we came from, and to teach our own sons and daughters of it. (Herman Agoyo, San Juan Pueblo, New Mexico)"----1998, Sabra Moore, "Petroglyphs Ancient Language / Sacred Art," p. 11. Carved and painted images on stone can be found on ancient sites all over the world. They represent some of the most important evidence archaeologists have to interpret cultural history. These visual images represents the photography of their time. The downside is their figural identity can be difficult to prove and they can not be carbon dated. Plus, you can't bring back the ancient minds of the artist/craftsmen who made them. But most petroglyph imagery can be identified and assigned to one of the local iconographic styles giving the site a cultural identity and time frame. It's the uniquely different styles and age that causes the most controversy and a great effort on behalf of researchers to prove their case. This article describes two such examples. They are images that appear to represent Ice Age animals in the form of Columbian mammoths. This picture shows an area of "rock art" on the Upper Sand Island Rock Art site in south eastern Utah. The pattern is thought to be very early and date to sometime between the Pleistocene-Holocene transition period, approximately 13,300 to 12,500 years ago. It represents a portion of a cluster of petroglyphs that are described as a panel. Although the highlighted area in this picture appears "insect-like" there are specific reasons why the image may represent a mammoth. The highlighted image is designated as mammoth 1 because it was the first of two mammoth designs that were discovered in the panel group. The design above mammoth 1 is described as a bison. Both the mammoth and bison were formed by pecking, incising, and scraping. They measure approximately 87cm (34.25 inches) from the tip of the mammoth's tusk to the tip of the bison's tail. The cut marks are significantly weathered and re-varnished over most of their surfaces. A comparison to more recent Ute horse petroglyphs located nearby show an obvious age difference between the two. 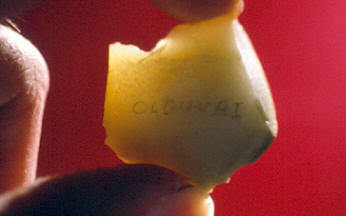 Magnification of the cut marks indicate that the mammoth and bison were not recently made or altered and that the bison was made after the mammoth. Mammoth 1 has several design characteristics that suggests it may represent a Columbian mammoth (Mammuthus columbi). The most obvious features are the domed head, tusks, and trunk. The domed head is clearly formed with a concentrated area of pecking marks. The raised area behind the head may represent a raised shoulder that is also a descriptive trait of mammoth anatomy. Mastodons did not have these two identifiable features. Mammoth 1 also has two parallel tusks that extend outward from an area lower on the head, unlike horns that would attach higher up near the top of the head. The trunk is impressive for its length and for the fact that it does have a bifurcated end that may represent "fingers." Many Old World Paleolithic cave sites, such as Chauvet in France, illustrate the ends of woolly mammoth trunks with one long and one short grasping "finger." The shorter one is referred to as the thumb. Although not very impressive, mammoth 1 has one front and two back "stick-like" legs. If there was a tail, it appears that it may have been removed by the addition of the above bison image. Mammoth 1 has one design trait that does seem odd. The vertical body segmentation makes the image look insect-like. Linear style quadrupedal figures in both horizontal and vertical forms are known in the area. But this style dates much later to the Middle Holocene and is not similar to the design pattern in mammoth 1. The Upper Sand Island Rock Art site is located about a kilometer upstream from a more well known petroglyph site called the Sand Island site. They are located in southeastern Utah along the San Juan River. Archaeologists first recorded the Upper Sand Island Rock Art site in 1985. The petroglyph designated as mammoth 1 was first shown to Malotki in the early 1990's. The image is part of a ten foot wide panel of several petroglyphs that researchers have assigned to a very early date. They are situated approximately five meters above ground level. 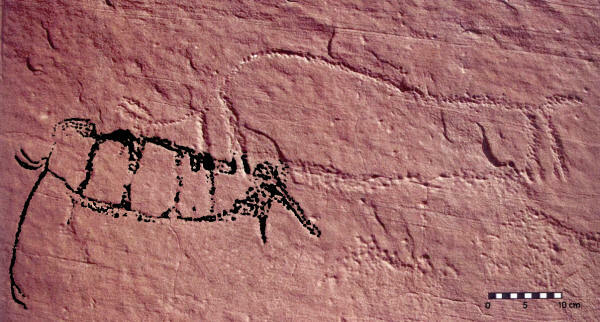 This picture shows a highlighted image of the petroglyph referred to as mammoth 2. It was discovered, from photographs, by Robert Ciaccio who assisted researchers with illustrations of the panel of early period petroglyphs. Mammoth 2 is situated approximately 8 feet (2.5 meters) to the left of mammoth 1 and about 5 meters above ground level. This figure appears more "mammoth-like" than mammoth 1 mainly because it does not have the vertical segmentation. It's domed head, tusks, trunk, and stick-like legs are very similar to mammoth 1. It also has a long trunk with a bifurcated end that seems to represent the two finger-like extensions most probosideans have. This image would fit quite well in a European cave painting. It measures about 13 3/4 inches (35cm) from tusk to tail. The age of the Upper Sand Island mammoth petroglyphs is an estimate taken from visual comparisons of surface re-varnishing within the cut marks. More recent petroglyphs found nearby are not as heavily patinated. Based on the identification of the petroglyphs as mammoths and the degree of surface re-varnishing within the cut marks, the mammoth panel is described as being made sometime between the Pleistocene and the Holocene periods. An estimated date of between 13,300 and 12,500 years ago has been suggested. 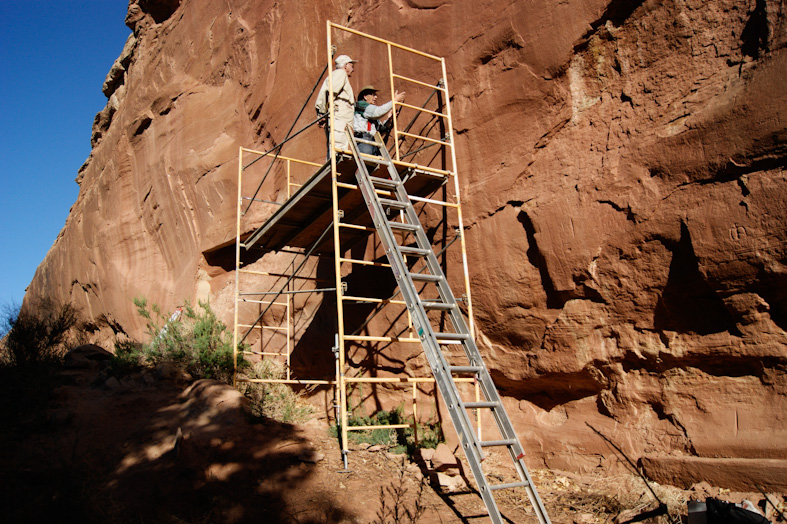 This picture shows how difficult it is to access the Upper Sand island Rock Art site's Paleo panel. This is the area where the two mammoth figures are located. The people observing the glyphs are professors Ekkehart Malotki and Jean Clottes of France. Jean Clottes is one of the best known Ice Age art specialists in the world. His comment about the mammoth images is, "---the proboscidean depictions are mammoths "without the slightest doubt." Numerous paleontologists also agree with him. Mammoth 1 is located on the right side of the panel and mammoth 2 is located at far left. Mammoth 1 has several design characteristics that suggests it may represent a Columbian mammoth (Mammuthus columbi). The most obvious features are the domed head, tusks, and trunk. The domed head is clearly formed with a concentrated area of pecking marks. The raised area behind the head may represent a raised shoulder that is also a descriptive trait of mammoth anatomy. Mastodons did not have these two identifiable features. Mammoth 1 also has two parallel tusks that extend outward from an area lower on the head, unlike horns that would attach higher up near the top of the head. The trunk is impressive for its length and for the fact that it does have a bifurcated end that may represent "fingers." Many Old World Paleolithic cave sites, such as Chauvet in France, illustrate the ends of woolly mammoth trunks with one long and one short grasping "finger." The shorter one is referred to as the thumb. Although not very impressive, mammoth 1 has one front and two back "stick-like" legs. If there was a tail, it appears that it may have been removed by the addition of the bison image that was put in place after the mammoth. This picture shows how high the mammoth petroglyphs are located above current ground level. The panel of petroglyphs are just above the person taking the pictures. From end-to-end the distance is about 10 feet. Mammoth 1 has one design trait that does seem odd. The vertical body segmentation produces an insect-like appearance. Linear style quadrupedal figures in both horizontal and vertical forms are known in the area and they date much later to the Middle Holocene. But this more recent form is not at all similar to the style found on mammoth 1. This petroglyph is located near Suwanee, New Mexico. It illustrates how difficult it can be to identify some types of animals. Although this figure seems to represent a mammoth with a trunk, tusks, domed head, and a raised area at the shoulder, researchers point to its cloven hoofs as probably belonging to a bison. Mammoth 2 appears more "mammoth-like" than mammoth 1 mainly because it does not have the vertical segmentation. It's domed head, tusks, trunk, and stick-like legs are very similar to mammoth 1. Mammoth 2 also has a long trunk that has a bifurcated end that seems to represent the two finger-like extensions most probosideans have. This image would fit quite well in a European cave painting of a mammoth. Mammoth 2 measures about 13 3/4 inches (35cm) from tusk to tail. Some petroglyphs are very easy to identify. 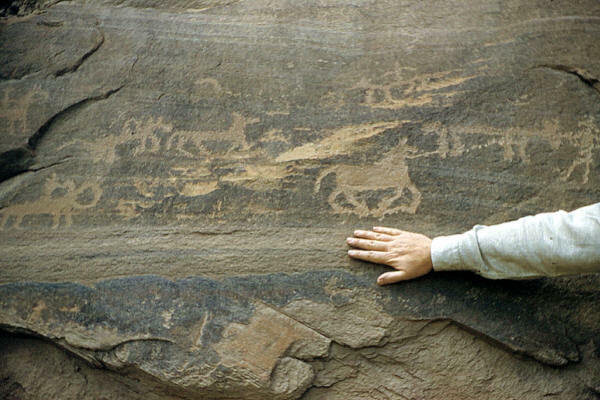 This picture shows some very late period petroglyphs in the form of horses and humans. Image identification and microscopic observation of surface varnish within the cut marks are just about all researchers have to help date these sites. There has been some criticism of the early date estimates and imagery identification for the mammoth petroglyphs. On the lighter side, they have been identified as transformational moths by one person and another argues that the image identification is nothing more than a Rorschach test. More serious arguments involves microerosion dating of the cut marks (only on the bison) and the geological position of the rock wall at the time when living mammoths walked the land. But these last two arguments are defended by Malotki, Vandenberghe & Mees (2014) for reasons that there is still not enough data to support them in an absolute scientific way. Unlike the painted images that were placed out-of-sight and deep with European caves, many petroglyphs were placed in locations that were meant to be seen. They were placed high on sheer cliff walls. As this picture shows, some petroglyphs took a real balancing act to apply. These human expressions of pictorial mammoth forms seem to represent some of the best visual images from North America's Ice Age. Although modern interpretation of an ancient's creation won't always be considered "absolute proof," the Upper Sand Island mammoths, especially mammoth 2, does look like a mammoth. If more of these images do exist more discoveries are likely to happen. Mammoth hunting in today's modern world may seem odd but it's a good bet there's a mammoth number 3 out there somewhere. 1912, Hodge, Fredrick Webb, "Handbook Of North American Indians," Bureau of American Ethnology, Part 2, Bulletin 30. 1919, Holmes, W. H. "Handbook of Aboriginal American Antiquities," Part I Introductory The Lithic Industries, Bureau Of American Ethnology, Bulletin 60. 1998, Moore, Sabra, "Petroglyphs Ancient Language / Sacred Art." 2000, Carol Diaz-Granados and James R. Duncan, "The Petroglyphs and Pictographs of Missouri." 2011, Malotki, Ekkehart & Wallace, Henry D., "Columbian Mammoth Petroglyphs From The San Juan River Near Bluff, Utah, United States." Rock Art Research 2011, Vol. 28, No. 2. 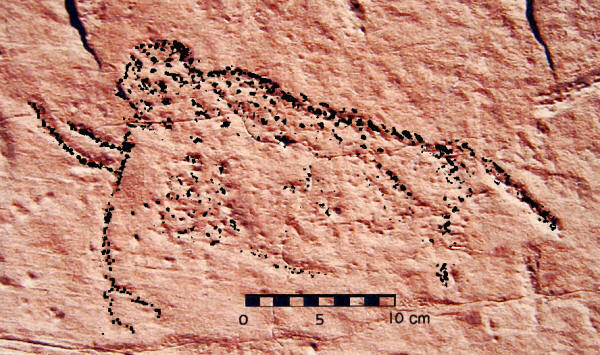 2013, Clottes, Jean, "Two Petroglyphs Of Probosideans At Upper Sand Island, Bluff, Utah," International Newsletter On Rock Art, No. 67. 2014, Malotki, Ekkehart, Vandenberghe, Dimitri, & Mees Florias, "The Significance Of The Upper Sand Island Mammoth Depictions Near Bluff, Utah, USA," source, academia.edu. 2015 Personal Communication with Ekkehart Malotki, Professor emeritus of languages at Arizona University.